The Holyoke History Room is dedicated to preserving the history of Holyoke and supporting research into the city's past. History Room collections include maps, photographs, city directories, and Holyoke newspapers (on microfilm) from the 1850s to the 1990s. 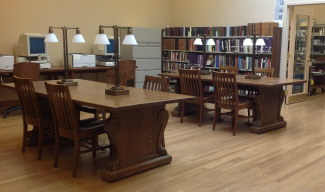 Biographical and subject files provide information on numerous Holyoke residents, landmarks, businesses, institutions, and organizations.The Reading Room is located off the third-level gallery in the new Holyoke Public Library. Two public-access computers are available in the History Room for patron use, as is free wireless access to those who bring their own computers or tablets. Please note that if the Holyoke Public Schools are closed due to weather, the Holyoke Public Library is also closed. For upcoming History Room events, click here. Please note that we occasionally need to close on T-W-Th between 12:30 and 1:30 PM. Collections located in the Reading Room are available during Regular Reading Room hours for use without an appointment. If you anticipate using archival or other collections, please contact the archivist 24-48 hours in advance of your visit. All History Room materials are non-circulating. For more information on our holdings, see Collections. Inquiries regarding class visits and student projects of all types are welcome. The best collaborations are preceded by a meeting with the Archivist, who can prepare and tailor your group's experience. History Room resources can be used to support research on a wide variety of topics related to the city and its history or to provide writing prompts and inspiration for creative work. Please contact Eileen Crosby at the telephone number below. Telephone and email inquiries: For patrons unable to visit the Reading Room, our volunteer staff can conduct limited research. To request an obituary search of the Holyoke Transcript-Telegram, please provide the individual's name and date of death as well as your own name and contact information. A small fee is charged for copies provided by mail or email. Please allow 7-10 days for each request.